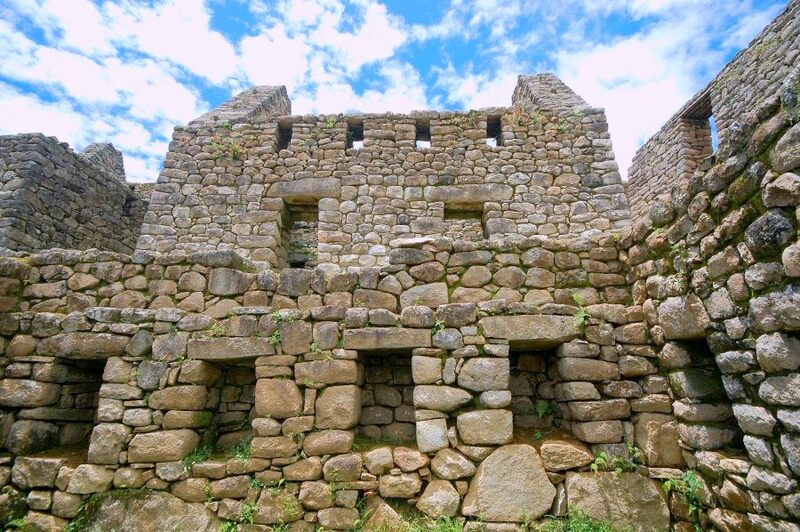 Return to Machu Picchu to explore the mystical ruins further. 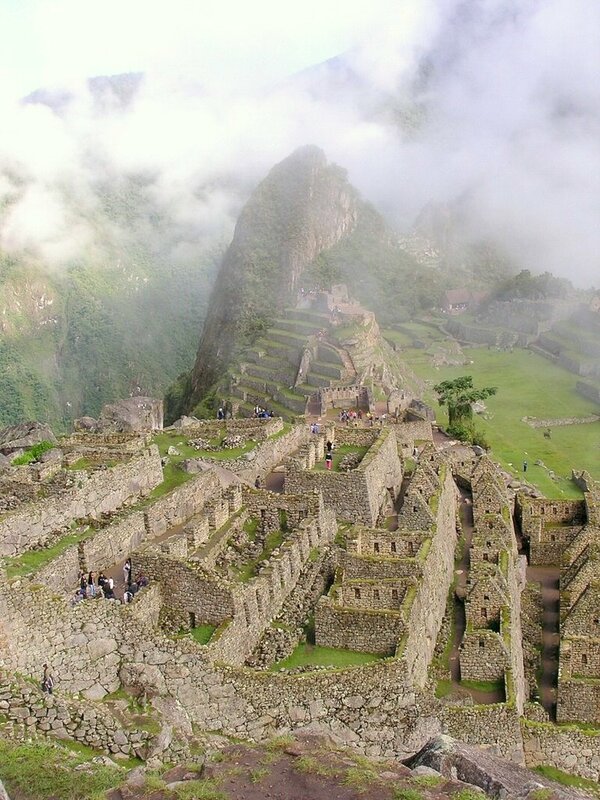 To this day nobody can explain how the Incas managed to transport the huge blocks of limestone for the city’s construction onto the mountain top. Visit quaint Aguas Caliente before your afternoon train ride to Cuzco. Last night we decided not to get up too early this morning – the odds of witnessing sunrise appeared to be close to nil during this rainy period. Now, a little after 8:00 a.m., we are on the bus, headed up through low clouds and dense fog. The mountains beyond the windows are completely obscured from sight. Once inside the gate, we are uncertain about how to get to the hut that stands alone at the top of the agricultural terraces – and whether we should even start there. (Well, actually, I am the only one to hesitate because I think we should wait until the fog clears). Soon we are headed up a steep trail under a thick green canopy. It is cool and shady on the trail, but rather crowded as we continually meet people coming down from the Sun Gate. Some seem elated by their time on the Inca Trail, however, others seem exhausted, stumbling clumsily down the trail. I concentrate on my footing and keep moving. At the first opportunity we leave the trail and walk out on a terrace. The fog and clouds are moving and lifting. As we approach the hut at the top of the terraces, the sky above is gloriously blue. Below us the ruins of Machu Picchu are bathed in glorious sunshine. It is a spectacular scene. We linger near the upper-most hut, taking pictures, examining the ruins, and enjoying the way the view changes as we walk along the terraces. While we aren’t the only visitors up here today, it doesn’t feel crowded and I feel the isolation of this place and how it could be possible for this once lively site to disappear for so many years. Mark, Lane, and I continue on toward the Sun Gate. The trail starts off wide and flat and the walking is easy, although Lane and I put on our umbrella hats to shield us from the now searing sunshine. From the trail we have lovely views of Machu Picchu itself, as well as the temple of the moon at the top of Huayna Picchu and the bus route that zig-zags up the mountainside far below. These man-made structures clinging to the mountainsides look tiny and insubstantial. There are also ruins along the trail, each providing an opportunity for us to stop and both examine the carefully set stonework and soak in the sweeping views. The trail gets narrower and rougher as Machu Picchu disappears from sight behind the mountainside. As we near the final section of the trail to the Sun Gate, I tell Lane and Mark to go on without me – I’ll wait here and meet them when they return. I can make it TO the Sun Gate, but I can tell that my legs are tired and I’m pretty sure I cannot make it up to the Sun Gate AND back to the bus. (And I’m quite sure they don’t want to have to carry me!) Despite my protests that they go on without me, they decide we should all head back. Back at the main site we quickly find Kathy and then the rest of our tour group (a smaller group today). Lucho has begnn today’s tour where we left off yesterday, heading toward the far end of the main site. It is fascinating to walk through these structures and think about the people who built this place, how they lived here, and why they vanished – leaving their existence a secret for so many generations. Yes, you do. Then I can listen to your exotic travel tales! Besides, you need to put that new passport to use.